How to make sure a Word paragraph stays on a particular page. Learn how to automate the use of smart quotes in Microsoft Word. Can you force a Microsoft Word document to fit a single page across multiple systems? Be aware of the subtle differences in each of these actions – when working on a Microsoft word document. The quickest way to delete all of the tab stops in a Microsoft Word document. Microsoft Word includes a set of handy shortcuts for creating foreign characters. SmartArt is a new type of graphical tool included in the latest versions of Word. 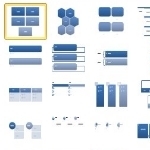 SmartArt is, basically, a way to make organized presentation art. Have you ever placed pictures in your document, expecting them to stay in a set location, and then you find that they moved around? This is not uncommon in Word, and typically can be traced to a misunderstanding about how Word handles pictures. Word allows you to use the mouse for many routine editing tasks. One such task involves moving rows or columns within a table. 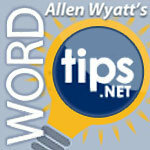 In Word, footnotes can be placed either at the bottom of a page or at the bottom of the text appearing on the page. Microsoft Word includes a feature that allows you to see what changes have been made to a document. One of the least used but most unique methods of editing a Microsoft Word document uses the mouse entirely. There are certain paragraphs that naturally belong with another paragraph. Learn how you can also specify that different headers and footers be used for both odd and even pages in Microsoft Word. The following macro, StepRightSentence, provides the capability to step through a document one sentence at a time toward the right. Ever wonder if there is a way to move graphic images out of a Microsoft Word document and into your own files. Sometimes you want to move a paragraph or two around in your Microsoft Word document.